Scan: RESET08 by kuroimisa Thanks so much for submitting so beautiful scans, misa! I WILL WALL THAT RIGHT NOW! Ummm, girly wall for a not that girly person. Very cool! The colors are fabulous and the patterns look great! Hmm im suprized this hasn't got many favorites yet i love it! (competition) areteii - winner gets HQ scans! I love the patterns you used! Who said plaid is out of style? I look at this wall and go "Why are my walls so uncolorful/creative? D:"
why are you making such uber awesome walls? I think that using a green skirt now with some patterns and jump around the world will actually make totally sense. plus I love the colors. nicely bright and has happy atmosphere which makes the viewer feel happy ~ bright colours are really making the wall jump out of the screen with the energetic theme :D vectoring is nicely done, lining is very clean and colouring is smooth. really like the patterns you made for the characters clothing, gives good details but also emphasize the bright colours and the touch of the enjoyment since the characters seem to be enjoying the summery atmosphere and the rainbow thingy. 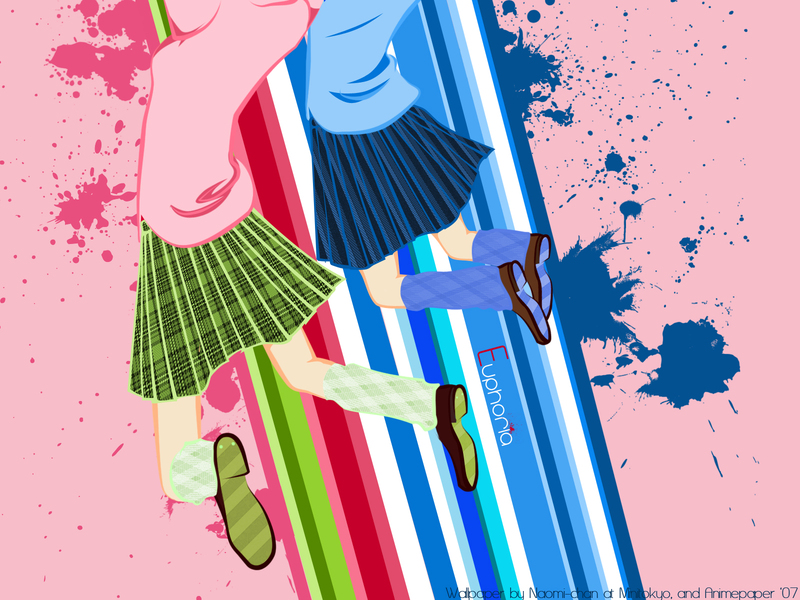 pink background colour fits well with the colouring of the characters and brings the blue colour more to be seen. paint splashings are neat details but resembles the energy very well. composition is balanced looking since even though the characters aren't in the middle, the slanting rainbow looking thing and the splashings on the left side of the wall gives counterbalance well for the other side. overall pretty work and thank you for sharing ! This is beautiful and unique... love the colors and the theme... thanks for sharing it!